Free delivery and discount codes for buying flowers and gifts for all occasions at Interflora.com. When buying flowers from Interflora you are buying from the experts with over 100 years experience in flower delivery across the UK and Europe. They have network of expert florists across the world ready to deliver flowers the same day if required. Choose from quality Mother’s Day, Anniversary, Valentine’s Day, Birthday or Wedding Flowers and save money with a voucher or free delivery code. Standard terms and conditions apply – Promotional code valid with a minimum spend of £60 excluding any delivery and payment charges. – Promotional code must be entered at time of purchase and cannot be used in conjunction with any other offer. Offer excludes overseas, giftcard and Interflora Gold purchases. Free delivery on a wide range of flowers? We have found a large selection of beautiful flowers available with free delivery as standard. Just place an order for flowers online and collect for free at participating florists nationwide. 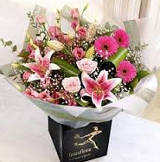 Get same day shipping worldwide at Interflora.co.uk, ideal for distant loved ones. A first glance at the name and you assume flowers. That’s just what you get when you visit the Interflora website. Images are laid out clearly to show the current offers and top picks from those browsing the site. As you browse, you will get a pop-up appear to invite you to join the newsletter. Those who sign up will get exclusive discounts on a regular basis, but it’s very easy to close the pop-up down if you’re not interested. It’s not all about flowers, though. It takes a while of browsing to realise that there are hampers and other gifts, too. This could be displayed a little more clearly. When it comes to deliveries and Customer Service, you do need to look carefully. The website has been designed for smaller screens and doesn’t automatically open up wider when on a larger computer screen. Delivery is next day if ordered by 3pm, and there is international delivery available. The site also makes a point of sharing that Sunday delivery is available for when you need it. Customer Support is available by phone, with the number displayed at the top clearly.